A.Section (A) in the Dashboard Table may contain records to represent a user defined period of time. B.Section (B) shows the summary data for the selected or highlighted record. C.The Copy Dashboard Record button (C) provides an easy means to copy an existing record. 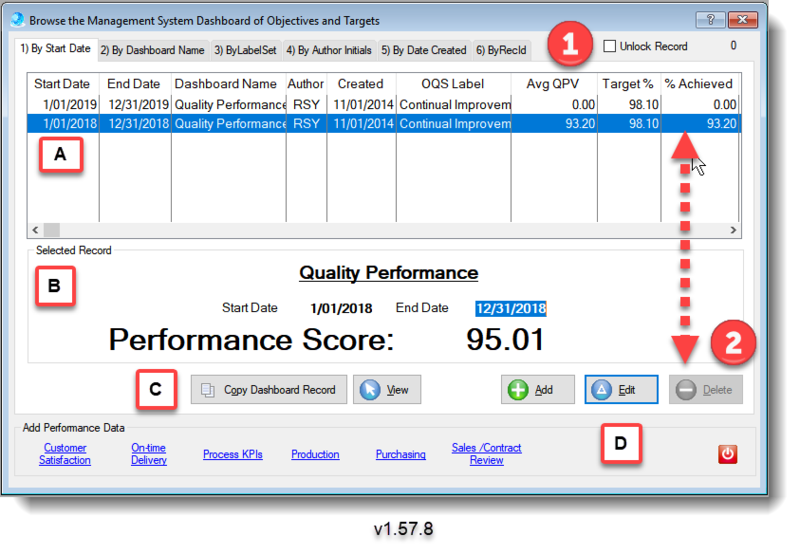 For example, you may need to create a Quality Monitoring record for the first quarter and later copy the first quarter for the second quarter and then only change the date range for the quality measurements. D.Section (D) provides controls to add, edit or delete a record. E.Section (E) contains shortcuts to add Performance Data to the Dashboard. 1)The Dashboard Records are locked by default to prevent unintended deletions. 2) The [Delete] button is disabled if the record is locked.